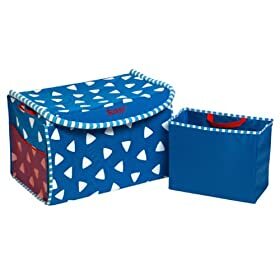 Children Toy Chests - Where to buy? We are setting up my 2 yr old daughter's new room. We are looking for a good quality toy chest, fairly large in size. We found one that we liked at e-Children, but it was $450! WOW! Seems crazy for a wood box to hold toys, not to mention kids generally wreck things. Has anyone seen any good toy chests somewhere else? Hopefully, CP can be more efficient than driving all around town and searching through stores. try making a post on criagslist for a used one, or try ikea? not as classy or nice but hard to wreck. We got my daughter one from a garage sale. Spring is a great time to get a deal on stuff like that at garage sales. Also, they have those units that have pull-out bins to put toys in at Ikea, toysrus, zellers... etc. Those are really handy for seperating toys out in. We use the rubbermaids and some of those spring form pop-up cylindrical toy hampers-they work great for smaller children, as they can "pull" down the side of the hamper to reach inside! We just took ours to Once Upon A Child. We paid way over $100 for it and they only gave us $10 for it..and it was like new. They are probably selling it for around 25. Maybe its still there. It is a girls one. Give Castle Toys a call. They have a soft sided toybox from Sassy, and it is under $40 I believe. We have one in my son's room, and it is a decent size and great for a lot of his stuff. We also have some colourful organizing bins that sit on a rack at an angle for his smaller toys. We got that one in white to match the rest of the stuff in our daughter's room. It's surprisingly rugged and not cheap like much of the other furniture from Ikea. I have a hope chest my father in law made a few years back before he passed away. Approx 2' x 3' interior dimensions. Solid Pine construction. Not specifically a Toy box but could function as one until she wants to start a hope chest fro herself. Comes with an engraved Brass placque(SP?) that says "For all your Hopes & Dreams"
I can get actual dimensions and send a pic or two if interested. I went to check it out (assumed it was the Macleod location), but it was gone. We looked at Ikea . . . The Levsik Chest/Bench is probably their best option. The Pine box seemed poor quality for her bedroom; for a rec room it would be a better option. I still havent found one that I like that I feel is a proper price. Nufy, you have any pics of the one you are selling? I'll take a few tonight. Leather bench with interior storage. CAD $299.99Prices may vary from those in store and are subject to change without notice. This product is not available for online sale. Please visit a London Drugs nearest you. Try this link for pics of mine. There is a Flames one at the Fan Attic. I think it was on sale for somewhere around $140... not positive though. TD location. Well, because I have so many outstanding projects of that nature that just arent getting done. I dont have much credibility at this point to start yet another project.